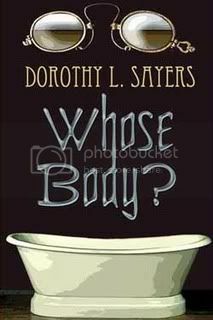 Wimsey has, when the story begins, solved at least one case of theft, and other criminal investigations of his are alluded to, and characters are spoken of as if the reader were expected to know them. Either it is a trick of Sayers’ to make the reader feel at home with the characters right away and make away with long “get to know them” passages, or the novel is the continuation of short stories about Wimsey. Either way, it does not feel like the first thing she ever wrote about him, and the aura of familiarity makes one feel as if the book has been plucked from the middle of a series, but without the reader having really missed anything. I liked this book much better than the previous Wimsey mystery I read, Five Red Herrings. That particular story was much too involved and mathematical for my taste, but this one is quite different, and I’m glad I didn’t let my dislike of the other book prevent me from reading this one. 4 stars. I have enjoyed most of her books, but this one is certainly a first-rate Golden Age mystery. And not without humour either, e.g. when it is revealed WHY the body ended up in that bath. I felt that some of her later books, e.g. Five Red Herrings and The Nine Tailors, were overly complicated and intricate, but this one was an absolute joy to read.